Alternatives are any law, policy or practice by which people are able to reside in the community, without being detained for migration-related reasons. The IDC has identified over 250 examples of alternatives from 60 countries, including those listed by country in this map. 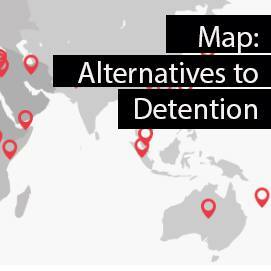 What the options are for children, who can not be placed in immigration detention? This short animation tells the story of a young boy and girl forced to flee their homes, and how detention can be avoided in order to complete their migration status.